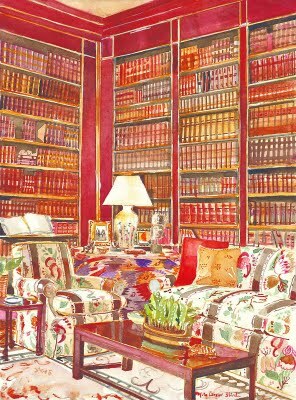 the brooke astor library designed by albery hadley. illustration by mita corsini bland from the book Sister Parish Design by susan bartlett carter & libby cameron. Wisdom is radiant and unfading, and she is easily discerned by those who love her, and is found by those who seek her. She hastens to make herself known to those who desire her. He who rises early to seek her will have no difficulty, for he will find her sitting at his gates. To fix one's thought on her is perfect understanding, and he who is vigilant on her account will soon be free from care, because she goes about seeking those worthy of her, and she graciously appears to them in their paths, and meets them in every thought. Do you love these words as much as I do? I have been reading them over and over and over since the weekend. I heard them on Sunday at mass. That's right, mass. Catholic mass. Some Sundays I go. Last Sunday this was the first reading of the mass, from the Book of Wisdom 6:12-16. I particularly like how Wisdom is given the feminine pronoun. Go back and read that first sentence again: "radiant...unfading...easily discerned by those who love her...found by those who seek her." I mean come on -- aren't you loving this? I knew I wanted to share these words with you. Aren't we all looking for her? It is filled with wisdom from the greatest design minds, from Sister Parish herself, to Albert Hadley, Bunny Williams, Miles Redd and many many more. It's a wonderful package of inspiration. And the room illustrations are so pretty and done by Mita Corsini Bland, who just happens to be the wife of Gerald Bland, the subject of an earlier blog post. It's funny how the world works: I was looking for wisdom and inspiration, so I picked up this book, then heard that reading, then wrote this and immediately thought of that room in this book...full circle. On my to do list: making myself worthy and keeping an eye out for her on my path. Wisdom. Toile is coming back. I've been comparing notes with colleagues and we agree wholeheartedly. OK, for sure it never really went away, but we think it's really really really coming back. Just gaze for a while at this photo and tell me you aren't amazed. KW's ubiquitous Imperial Trellis doesn't hold a candle to this! This is the mastery of Carolina Herrera -- the interior, the dress and the model (her daughter). I saw this recently on Habitually Chic. Visit to see whole post by clicking here. But don't miss the post on the book Sister Parish Design, click here and then don't miss the link to the house tour of the Gerald Bland home here. Remember when I was telling you about my visit to his gallery in June? The man has scads of style!